Man the alarm came way to quick as it seemed like I had just went to sleep. I got up at 5:15 so I could be downstairs by 5:30 AM to get a quick bite to eat and be at the rider meeting at 6:00 AM. There was already a lot of riders there when I got to the banquet room and there was also some breakfast sandwiches available. I had some coffee and something to eat and waited for Mike Kneebone to start the rider meeting. Mike made some announcements and so did Tom and Lisa. Mike then read off the top 10 riders and posted the list outside the door to the banquet room. Well, I was not in the top 10 and was not expecting to be at this point of the rally but I really wanted to know what position I was in. There was a few more announcements and then the rally packs were handed out. We all headed for our rooms with a quick stop to look at the standings. 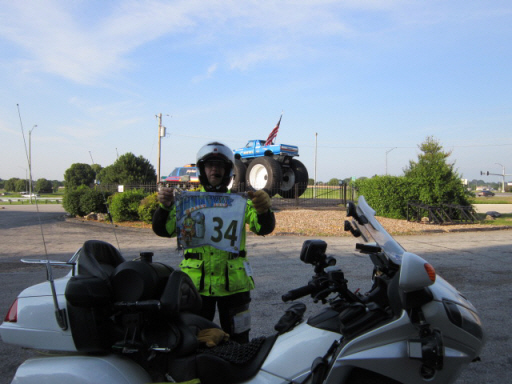 I saw I was in 14 place with 18,200 points and that I had ridden 3537 miles, I thought this was not bad for the first leg of the rally. I was not sure how I was going to do as I was still getting over the flu when I arrived at the hotel a few days before the start. I had also not gotten into the physical condition that I had planned for before the rally due to traveling for work every week for 8 months leading up to the rally. But being in 14th really let me know I had a shot at my goal which was being in the top 10. I just needed to keep doing what I am doing and maybe turn it up a notch. Since we were going to be headed west for this leg I knew I would have an opportunity to wick it up a little. I headed upstairs with the rally pack to get started planning my route. I knew this leg would be easier to plan than leg 1 as I did not have to worry about Canada and there was only 64 hours to get to Sacramento scoring bonuses along the way. Once you take out the time for a rest bonus, gas stops and bonus stops there would only be about 48 hours of riding time. 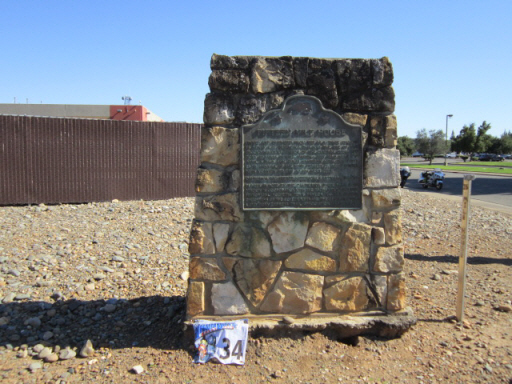 It takes almost 35 hours just to ride to Sacramento so how many bonus stops can you make. Well after reading the bonus pack I saw there was plenty of opportunities to score many bonuses if you planned your route around the Pony Express bonuses. There also was a Pony Express combo bonus that was worth 10,500 points if you documented all 34 pony express bonuses in the rally pack. I quickly started working on the rally pack by following my process in numbering the bonuses and then renaming the bonuses in Mapsource. Since we were given all of the bonuses for the rally at the start banquet I needed a way to filter out only the leg 2 bonuses so I assigned them to a category in Mapsource while entering each of the bonuses information. This was how I was able to filter out all of the other bonuses and only see leg 2 bonuses on the map. Once this was done I saw that there was only two good route options and one was based around the pony express bonuses and the other was based around the Pikes Peak bonus. The Pony Express combo bonus required stopping at 34 bonuses and not making one mistake. To me that seemed like to many chances to screw up so I quickly opted for the route based around Pikes Peak. It still took me a couple hours to do everything I needed and get a good preliminary route, pack the wing and hit the road. I was not the first or the last to leave the parking lot for leg 2 but I was a little ahead of my schedule and I showed up at my first planned bonus ( Pennsylvania Trolley Museum ) 20 minutes before it was available. 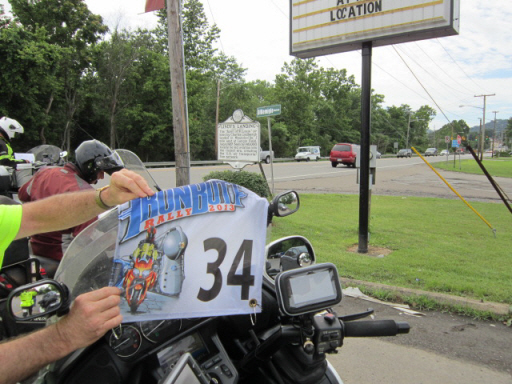 It was only 41 miles from the leg 2 start hotel and there was about 10 or so other riders waiting there when I arrived. I quickly decided it was not worth waiting around for this bonus so I hit the road and headed for my next bonus. I wanted to make it to Pikes Peak early the next morning and be there when the park opened as it was the July 4th holiday weekend and I expected the park was going to be busy and with only one road up and down the mountain I did not want to get caught in a long line of traffic. 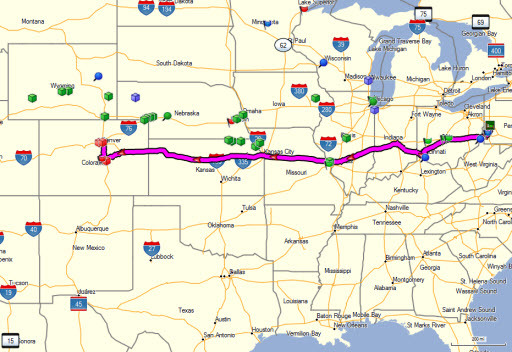 My planned route to Pikes Peak including bonuses was 1580 miles and I wanted to be there by morning of the next day. I left the hotel at 9:00 AM and arrived in the area 23 hours later. I guess I did a BBG ( 1500+ miles in less than 24 hours ) on the way to the Pikes Peak bonus. I arrived at the checkpoint ( Marriott in Rancho Cordova ) at 5:15 PM local time, a couple hours before the penalty window starts. I asked where the rider check in was and went in and stopped the clock. Once you stop the clock you have one hour to present yourself for scoring. Arriving a little early gave me time to not have to rush reviewing my documentation and being sure I had everything in order before heading for the scorers table. There was a banquet room setup for the riders to work on their documentation and eat. There was a buffet style setup with what tasted like good food. Of course I had only had a couple hamburgers the previous couple days so probably anything would have tasted good. I do remember that the salad and dressing was really good. I setup my laptop and got some food and sat down to review all of my photos, receipts and required documentation. I reviewed the rally book to be sure I had claimed all of my bonuses as that is easy to forget to do. I then copied all of my bonus photos to my laptop so I would have them for the future. Once I was finished I headed for the scorers table and got my name added to the list of riders waiting to be scored. I felt I had a pretty good route and hopefully did not lose any positions in the standings. My name was called and I sat down at the scorers table ( sorry, I do not remember who scored me in Rancho Cordova ) and presented all of my documentation. Scoring did not take long and I had a total of 23,778 points for the leg which gave me a total of 41,998 points for the rally with one more leg to go. I really wish I knew what position I was in but we would not find out until the morning just before the RM hands out the leg 3 bonus list. I headed up to my room to get some sleep after a last minute trip out to the parking lot to retrieve one of my GPS's so I would be ready in the morning when we get the rally pack. I setup my laptop and started Streets & Trips and Mapsource so I would be ready after getting the rally pack. I think I got to sleep by 11:00 PM and slept hard as I was tired and really needed some good rest. I don't think I moved until the alarm went off at 5:15 AM. Leg 2 Notes: This basically was a dash to the west coast with a few stops along the way. It did not take me long to decide against the Pony Express combo bonus. With 34 stops required to score the combo bonus provided to many opportunities to screw up in a short leg. I quickly decided to base my route around the Pikes Peak bonus. Of course I did not realize the ride up to the top of Pikes peak was what it was. You see I live in south Florida, the flat lands and where the tallest mountain is a trash dump and our best curves are the ramps along the interstates. 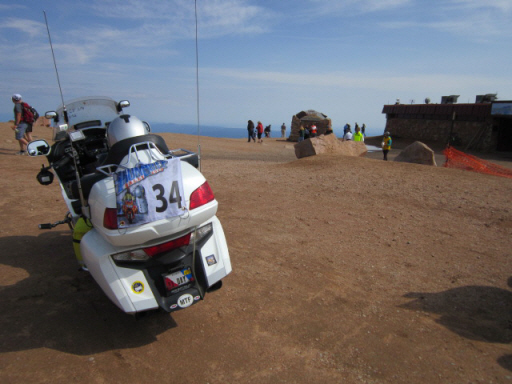 It was 41 degrees at the top of Pikes Peak and 107 degrees on the way to Rancho Cordova. 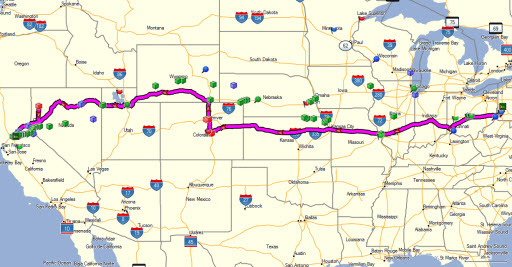 My Initial Leg 2 Route: For leg two I only planned a route to Denver and planned to work on my route on the road as I would have a 1000 mile ride to Pikes Peak from the BIG ( Big Foot ) bonus in St. Louis. This gave me the time to do a lot of what if analysis and find what I hopped was the best leg 2 route. My Actual Leg 2 Route: In leg two I pretty much rode my planned route until the bonuses around Denver including Pikes Peak. 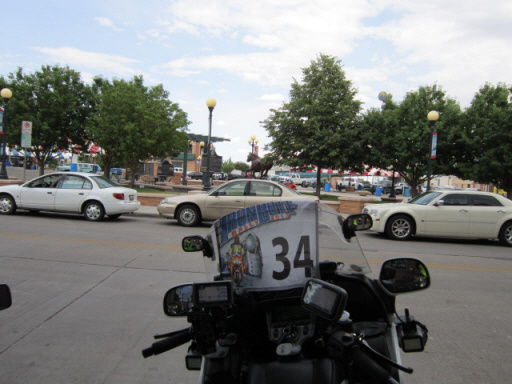 Then I re-planned my route to go north to Cheyenne and then west on I-80 with a quick ride up to Gerlach and back to I-80. I picked up 4 more bonuses on my way to the checkpoint. I rode 3076 miles in this leg and got in a good long rest bonus just east of Salt Lake City. Below are the bonuses that I scored in the order I scored them. 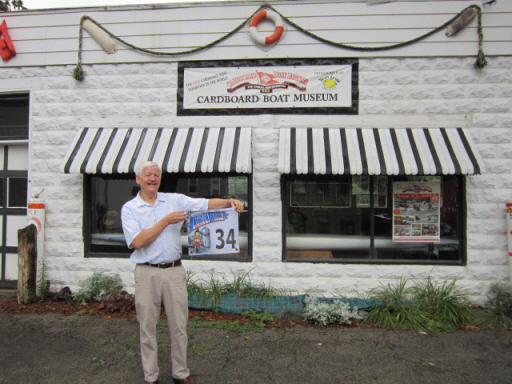 Bonus Requirement: Take a photo of the Lindy's Landing plaque. I rode up to this bonus and Hoagy Carmichael was there and he was kind enough to help with holding my rally flag. 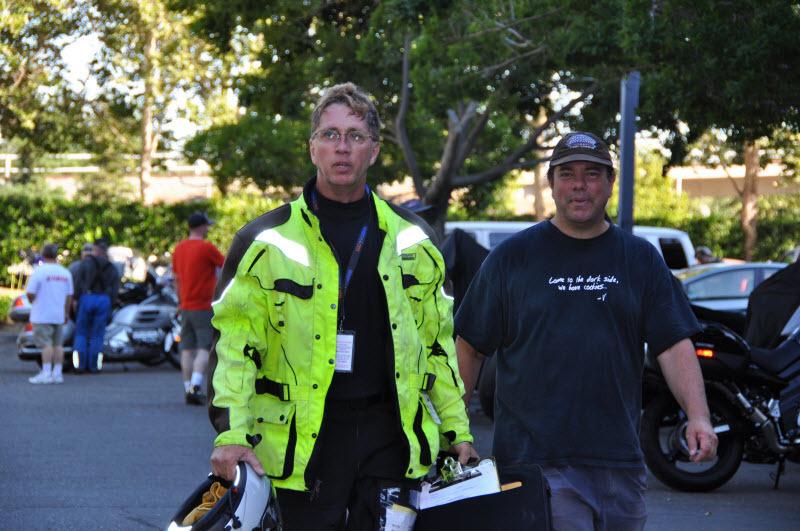 He told me about a rider who needed a new tire and that he was trying to help the rider find a tire near by. Bonus Requirement: Get a receipt for the museum tour and take a picture of the BMW R47 while touring the Museum. When I rode up to this bonus there was abut 10 other motorcycles in the parking lot. Someone said there was a problem with this bonus so I went inside and the person at the cashier booth said the motorcycle I was looking for was not on display and that he had already spoken to the RM and had a print out for me. I also got a discount for the entry fee since I am a AMA member. I spent a little to long at this bonus talking to other riders in the parking lot. 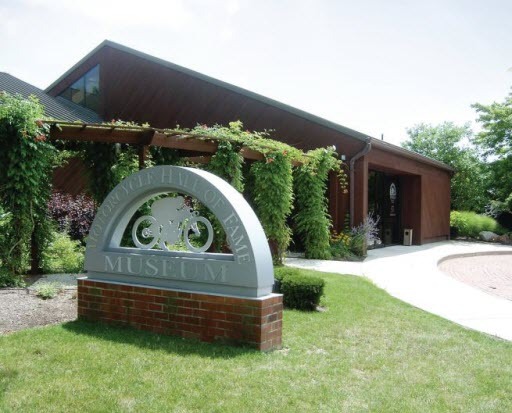 Bonus Requirement: Take a photo of the museum. I would have never known there was a museum for cardboard boats. Hell, I did not know they even made cardboard boats. I arrived at this bonus as another 2 riders were riding off. The building was a little set back off the road between two buildings so you had to look for it. There was a nice man there who agreed to hold my rally flag while I took my photo. This was a quick and easy bonus to score. Bonus Requirement: Take a photo of your Motorcycle in front of BIGFOOT on display outside. I rode up to this bonus and there was a nice couple ( Mike & Jean ) camped out with water and a sign greeting IBR riders. It was nice to see some friendly faces. They agreed to take my required photo while I held the rally flag. I wish I would have had more time to hang around a talk. Bonus Requirement: Take a picture of the restaurant. 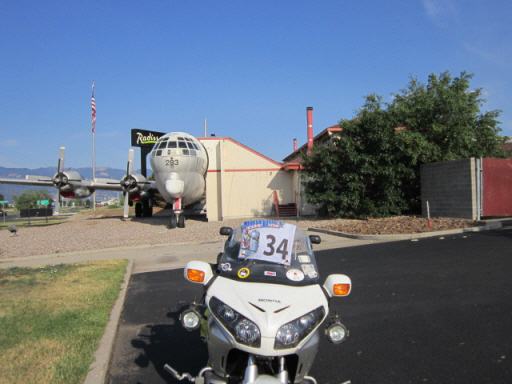 I rode into Colorado Springs around 7:30 AM local time and quickly found the food airplane restaurant bonus. While there Matt Wise road up on his BMW GTL and we rode over to a nearby gas station to fill up before heading to the Pikes Peak bonus. I had ridden all night from my last bonus in St. Louis with a couple short stops in rest areas on I-70. I was getting tired so I stopped at the first Kansas Turnpike plaza for gas around 10:30 PM local time and got a cup of coffee. I saw Jon & Ande Good/Bergmann here and we spoke for a few minutes. I got back on the road after about 15 minutes and I only rode another hour before I was feeling pretty tired again. I pulled in to a rest area on I-70 and took an hour nap on top of a picnic table. I was surprised I actually slept as I am usually a little unsure of sleeping in rest areas with the things that go on in today's world. I got back on the road and only rode another 2 hours before I needed a little more rest. I pulled in to another rest area on I-70 and again feel asleep on top of a picnic table in all of my gear. Shortly after I laid down Dennis Powell pulled in and he curled up in his bike cover on the floor. I slept another hour and felt good after this rest and was fine until 8:00 PM that day. 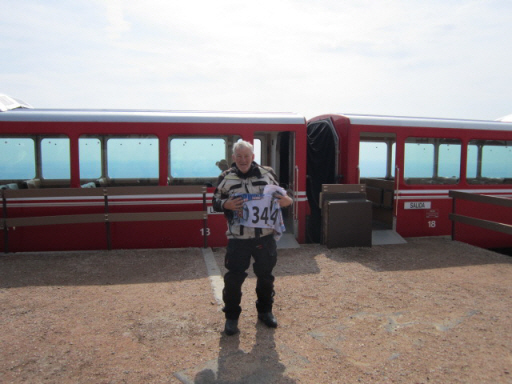 Bonus Requirement: Take a picture of the train at the Summit of Pikes Peak. If you are unable to include your bike in the photo, take another photo of your bike in the parking lot at the Summit. I arrived shortly after the park opened up and there was a short line already. There were about 8 other riders in line also waiting to pay the entry fee and ride up the mountain. I have been at some pretty good heights in my days but this is the highest point I had every been at. It was not bad until you got above the tree line then the road really got pretty twisty and technical. The switchbacks were steep and there was no where to stop while rounding them. I followed Greg & Pat most of the way up and I noticed their Gold Wing was over heating and peeing fluid. It was in the low 40's at the top so it was pretty cold with a 30 degree temperature change from the bottom of the mountain. There was a lot IBR riders, cars and people at the summit and I was lucky the train was already there so I was able to get my photo pretty quick. I could not get my motorcycle back by the train so I had to take two photos proving I was there. I did not stay at the top long as I did not like it up there and I had a lot of riding to do before the checkpoint. 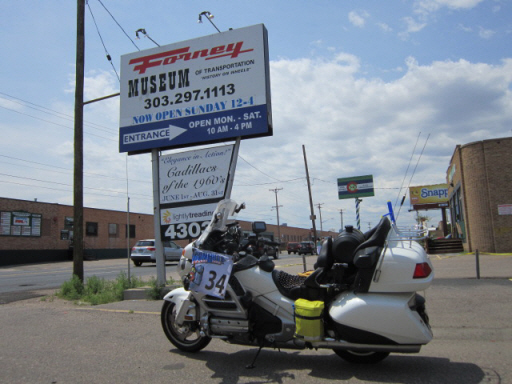 Bonus Requirement: Take a photo of the museum sign with your motorcycle in the picture. 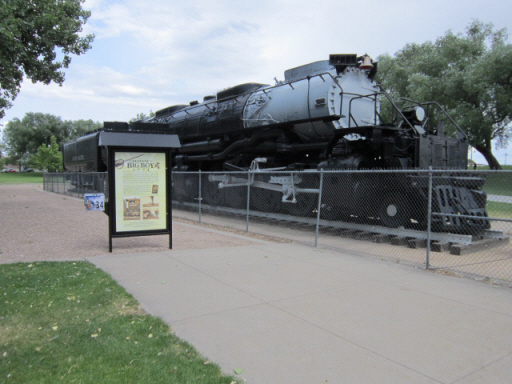 This bonus was just north of downtown Denver near the Union Pacific railroad yard. I rode right past the sign into the parking lot and looked around and could not find the bonus. I spent a few minutes off the wing trying to find the bonus. Finally I got back on the wing and road out to the front by the street and damn, there was the sign. I had lost a few minutes here and so I quickly took the required photo and hit the road. The next bonus was about 12 miles away just west of Denver. Bonus Requirement: Take a photo of the sign at the entrance with at least one railcar in the background. I quickly found this bonus and saw Tony Osborne there. I had a little bit of a hard time trying to find a good place for my rally flag and still get one of the railcars in the photo. From here I headed north towards Cheyenne, WY and the 2 low point bonuses there. On the way it had really warmed up and I had not had anything to eat since well I did not know. I was hungry so I stopped at a Arby's at exit 262 on I-25. I took a nice long break inside with the air conditioning and it felt pretty good to relax for 30 minutes. I met an older couple there who had a million questions about the IBR and my motorcycle. Bonus Requirement: Take a picture of the Big Boy. This bonus was inside a park called Holiday Park and my GPS's routed me right to the bonus on the road but there was no entry there as the park was surrounded by a fence. I did a quick U-turn and found the park entrance and it was a little bit of a ride back into the park to where the bonus was. This was a big locomotive and probably one of the most powerful back in its day. I took a good photo and headed for the Iron Horse bonus 3 miles away. Bonus Requirement: Take a photo of the Iron Horse. This bonus was in downtown Cheyenne and there was a lot of people there. Finding the bonus was easy but finding a place to park was a little harder. I finally found a place to back the wing in and get my photo. I used something I learned earlier in the rally to take my required photo here to make this a faster stop. My next bonus was going to be a Pony Express bonus in Salt Lake City but I dropped it as I was running a little behind due to heavy weather and taking a long rest bonus. On the ride to Salt Lake City the weather turned pretty bad and heading into the mountains east of Salt Lake City the overhead sign displayed a warning of high winds and it was already raining pretty good. I decided to go ahead and take my rest bonus in a small town called Evanston, UT. There was a reasonable nice Best Western there. I took the full 8+ hours and scored 2880 points. I rode 560 miles between this bonus and the next one west of Salt Lake City. Bonus Requirement: Take a photo of your motorcycle with the marker. This was a quick 4 mile ride off the interstate down the road to the bonus. I was able to make quick work of scoring this bonus and back on I-80 headed west. I saw 3 other riders also headed to this bonus. 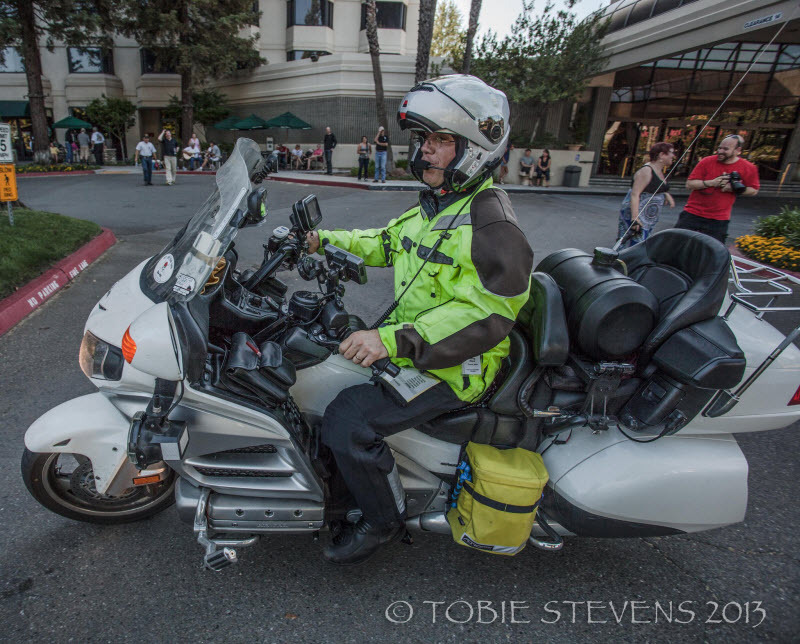 I meet up with Howard Entman on I-80 and we rode pretty hard for 100 miles or so headed to the next bonus. Thankfully the V1 alerted me to a potential issue just east of Elko. 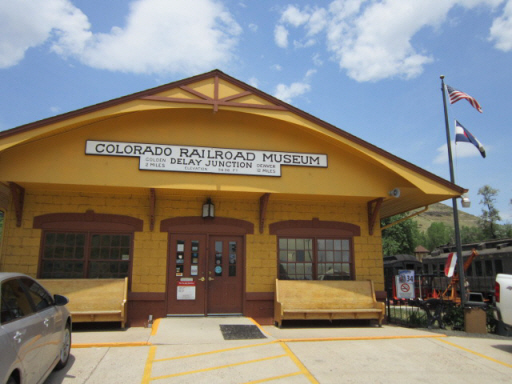 Bonus Requirement: Take a picture of your motorcycle in front of reconstructed station. This was the first Pony Express bonus I scored. If I had attempted the Pony Express combo bonus I would have stopped at 16 Pony Express bonuses by now with another 18 to go. I still think I made the right choice for me. I rode up to the bonus and saw Matt Watkins and a couple other riders there. This was a quick and easy bonus to score. I was only there maybe 3 minutes and headed back to the interstate. 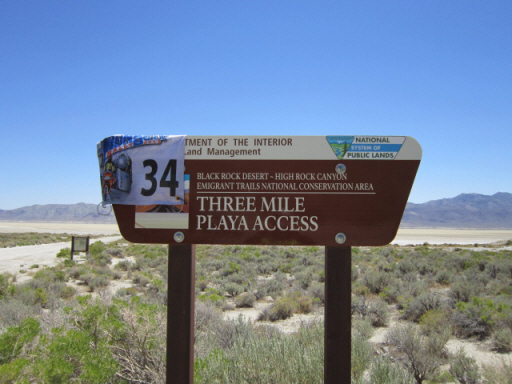 Bonus Requirement: Take a photo of the sign designating the entrance to the Black Rock Desert-High Rock Canyon Emigrant Trails National Conservation area located at the coordinates listed above. Sometime during the rally I decided to mark unpaved roads as one of the avoidances on my GPS as I did not really want to do to much off road riding. Well I am glad I did as on the way to this bonus there is a short cut on Jungo Road over the mountains that turns into a goat trail and I would never had made it. Thankfully my GPS routed me farther down I-80 to the paved road to Gerlach. I had decided to ride out to Gerlach to this bonus for two reasons, one, I had never been to Gerlach and it is a sacred place for IBA members and two, this was a big point bonus that I really needed. It was a little risky to attempt this bonus late in the day as it was still 250 miles from the checkpoint and was a long ride out and back from I-80. I also still had four more bonuses I wanted to attempt. It was a long hard ride down Hwy 447, it was hot and I was tired. There are also a couple cattle guards that make it interesting if you don't slow down before you get to them. I was lucky to get a little air on one of the cattle guards which can be pretty exciting on a Gold Wing. This bonus is in the desert and pretty much the only thing around is the small town of Gerlach. 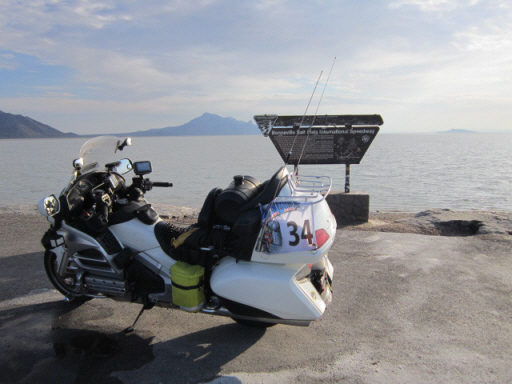 I arrived at the bonus just before 2:00 PM local time and I had 6 hours to ride 250 miles and attempt 4 more bonuses. 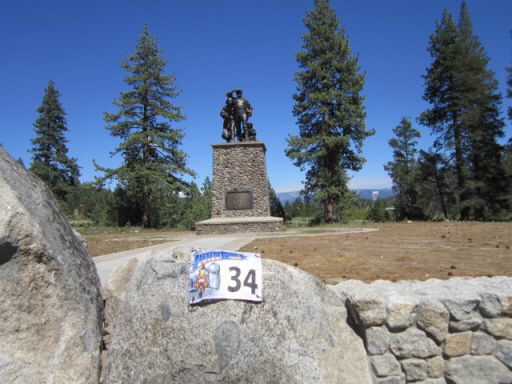 Bonus Requirement: Take a of photo of the Donner Party Memorial statue. When I pulled off I-80 to head for this bonus the GPS brought me close but I could not see the bonus and rode back down the road to the I-80 exit and then hit the recalc button on the GPS to be sure it had me in the right direction. It turned out the bonus was inside the state park and I had to enter the park to get to the bonus. As I was about to enter the park 4 other riders pulled up and we all rode into the park to the bonus. I took my photo pretty fast and headed back to I-80 enroute to the Chinese Railroad Men Memorial which was a 65 mile ride. By now I was pretty beat and it had been hotter than hell all day. 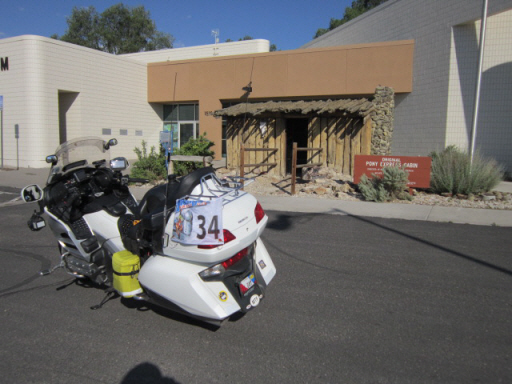 Temps were above 100 since morning and the ride out to Gerlach was pretty hard on me in many ways. 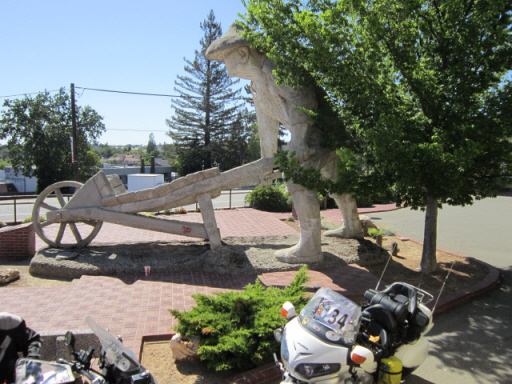 Bonus Requirement: Take a picture of the statue with your motorcycle in the picture. I was not sure what the bonus represented but hey it was a bonus and I scored it. I was really feeling it now and I really had to focus even though it was only a few miles on the Interstate. I did see a couple other IBR riders here. It took me a couple minutes to find a good place to take the photo as your motorcycle needed to be in the photo. It was a 20 mile ride to the next bonus and it was heating up. 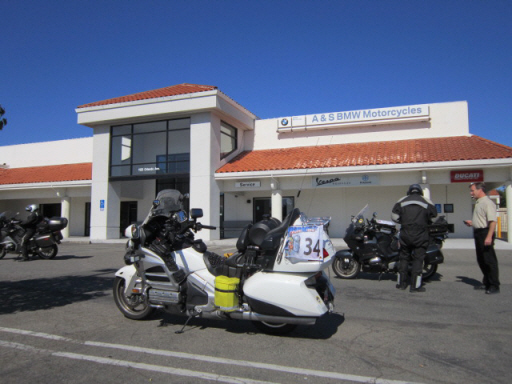 Bonus Requirement: Take a picture of your motorcycle in front of A&S BMW. It felt good to ride into the parking lot of A & S BMW. I was now only a few miles to the checkpoint and I knew I was going to make it on time. I saw a lot of other riders here and I spent a couple extra minutes talking to a few of them. I took a chance to catch my breath here and to get ready for the short ride to the last bonus for me on this leg. Bonus Requirement: Take a picture of the marker. It was all city riding to this bonus from the last bonus and I lost count of the traffic lights I had to wait for. I really wanted to push hard but knew better and took my time. I was too close to the checkpoint to make a mistake now. This was the last bonus for leg 2 and man I was glad I was now headed for the checkpoint and a hotel bed. Spotwalla Tracking Map: Leg 2 Spotwalla tracking map. 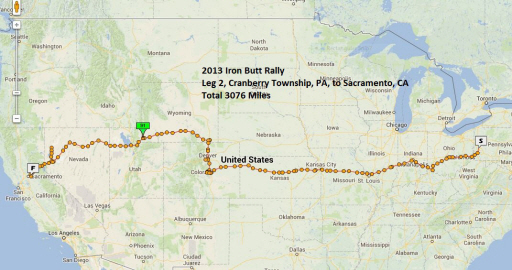 I rode 3076 miles in this leg and did a BBG from the start of leg 2. I scored 23,778 point in leg 2. which was good for 12th place at the end of leg 2. I felt I had a pretty good leg but knew it was still short of my goal. Copyright © Greg Rice 2013. All Rights Reserved.